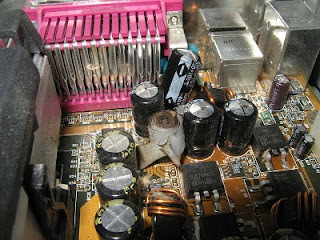 The Bad News...I found out that my computer has 5 blown capacitors (photo of blown capacitors from wikipedia below) *sad face* That is why it keeps shutting down on me. I do have to say that I have been having withdrawals, LOL!!! I have today off today (since I am working on Friday), so I hope to pop in later with some stamping!!! Luckily I have my laptop~so I am not totally "unhooked"
see ya a little later peeps!!!! Bummer about the computer Gretchen, hope you get it back soon. Mine needs some major work (keeps crashing) but it is the only one in the house at the moment and I fear I may just die if I have no access at all!